With rich industry practice, we are providing a comprehensive series of Ice Cans. Our presented product is made in tune with the industrial defined norms. 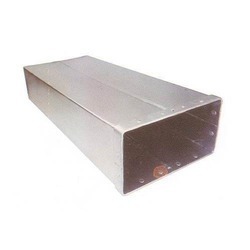 Due to top features, this product is widely employed in the industry. Further, our valued patrons can purchase them at nominal prices. 50, 100 & 150 lbsIce cane made out from 16Guage heavy duity sheets with hot dipped galvanised ring in various capacity as above. Specification:Capacity of ICE Inside Dimension of Top WID Size of Top Ring Thickness of GI Sheet App. Weight Empty Cans100 Lbs 8 x 16 x 351/2 40 x 6 mm 16 Gaze 14 to 15 Kg.150 Lbs 8 x 16 x 39 40 x 6 mm 16 Gaze 16 to 17 Kg.300 Lbs 11 x 22 48 40 x 6 mm 16 Gaze 27 to 28 Kg. We manufacture Ice Cans that are designed and developed in accordance with international parameters of quality and related norms. 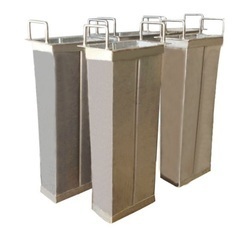 We are counted among the renowned Ice Cans Manufacturers in India. The Ice Cans offered by us are available at market reasonable price. Ice making equipment includes ice cans with versatile specifications. The application of latest manufacturing techniques along with authentic materials gives the special features to our range of ice cans. We always follows industry specifications to manufacture this product. Ice Cans are made out of galvanized sheets (G.P) in heavy gauges. On the top of these cans heavy & mild steel (M.S) ring is riveted for lifting. These cans are made according to the requirement of the customers and are available in some standard sizes like 400 lbs, 300 lbs, 100 lbs and 50 lbs. Pishori Lal Refrigeration & Engineering Co.